Clay Aiken plus summer usually means a concert tour. This year, there is no summer tour for Clay. However, we still have some great videos of Clay concerts. Today, we are highlighting a great video by SueReu. It is called The Lost Rossini Medley. This great video takes scenes from the 2007 summer tour and puts them to the music of Rossini. If you want to see Clay at his best and have a good laugh, watch this video to the very end. OMG…….that was great!!! SueReu, you captured our goofy Clay Aiken at his bestest. I miss concert Clay. Thanks Sue and Musicfan for posting this for us to see. ahhhhhhhhhhhh, thanks musicfan!! I loved making that video, chuckled all the way through it. 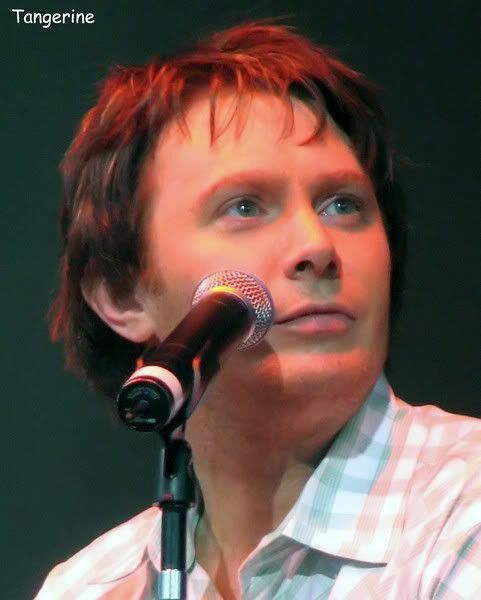 Clay Aiken is amazing in concert and I really do miss him! Clay is so very funny and loves to work other people into his comedy. LOL! This is a keeper! One day he’s going to surprise us and slip something like this into a concert. That’s why I love his concerts. ya never know what you’re going to get and not only does his singing get you, you leave after laughing so hard you hurt! Thank you for posting this fabulous video of SueReu’s! It’s been too long since I’ve watched it..it’s just one of the most entertaining works I’ve ever seen. Love the video! As a classical musician, I thought the SRHP orchestras were kind not to mess up Clay’s “slow music” shtick. There is a wealth of fast symphonic music. Clay Aiken certainly does move to the music well, however; and his comical conducting is great fun. Thank you for another great blog and for your kind comments at Carolina On My Mind. This was alot of fun and brought back great memories of Summer Tour 2007. Thanks guys for the video. I smiled all the way through it!! Enjoyed that video from SueReu. We just recently watched the video clack from the Pala. That was such a fun concert. This video was lots of fun. Thanks for posting it for us to see. Error: Error validating access token: Session has expired on Tuesday, 21-Aug-18 16:13:01 PDT. The current time is Thursday, 25-Apr-19 18:11:01 PDT.